As part of their route upgrade programme Network Rail will be replacing the bridge on Constable Road. This will require the road to be closed to enable the demolition and rebuild. The current programme is to implement some lane and footway closures between 10 April and 1 September 2017. There is expected to be a full road closure for the works between 23 October 2017 and 1 June 2018. During this time there will be a diversion in place and also a temporary footbridge. This is a draft programme and these dates are subject to change and are correct at the time of writing. 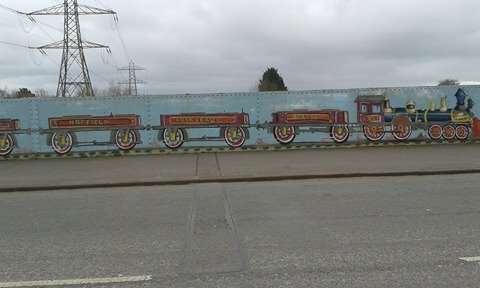 This bridge contains the mural that was commissioned as part of the ‘old’ Feeling Good, Feeling Safe ‘crime’ group under Neighbourhood Renewal around ten years ago, with young people in the area involved in its creation. Bristol City Council are working with Network Rail to try and save the mural and exploring the possibility of getting some new artwork for the replacement bridge. These discussions are ongoing but a potential home for the mural (if it is able to be saved during the demolition works) is the Horfield Community Association, based at the Wordsworth Centre.